There's nothing like adding a beautiful Pergola or deck and Pergola to dress up the exterior presentation of a home. We design our decks and pergolas in consultation with our clients, then pull permits and away we go. This tight knot cedar deck and pergola were constructed on a century old house in Newberg, Oregon and includes custom-designed cedar louvers that can be opened or closed for privacy. 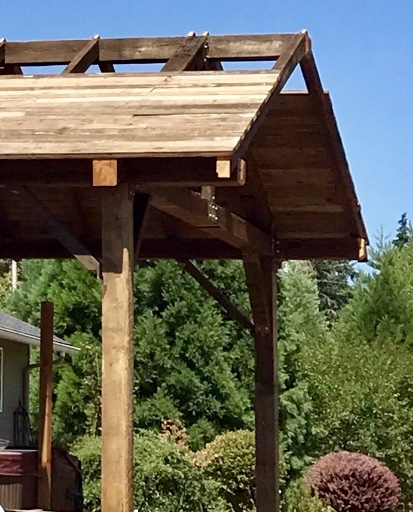 The stacks of lumber pictured were designed for a large pergola project in South Salem. We drew up the design of the pergola, hand-selected reclaimed boards from our lumber yard, cut the ends, and assembled everything for pick-up.